Should You Apply for a Job When You Don't Meet all the Qualifications? Should You Apply for a Job When You Don’t Meet all the Qualifications? Although it is often recommended that you apply for a job you are interested in and feel qualified for, is it wise to apply for positions where you don’t meet 100% of the requirements? Let’s suppose you only meet 80% of the qualifications or perhaps you don’t meet any of them at all, there may be times when I would recommend that you go ahead and apply anyways. At this point you will need to ask yourself why you are thinking about applying and if it really makes sense for you to try? If it does, go ahead and apply since you can always decide later to withdraw your application. When preparing your resume and cover letter for any job, you will first want to look at the position description and then review the qualifications. If you feel that you meet the majority of the qualifications, it is probably wise that you go ahead and apply in hopes of getting called for an interview. By targeting your resume and cover letter you will be matching your skills and qualifications to the employer and the specific position available. If you find that you lack the specific skill they are looking for, you will want to highlight your transferable skills, which could also get you called for an interview. By asking yourself why you want to apply, you may find your answer. Does the job look appealing and are you excited about just the thought of applying? Is the job in an industry or career field that you’ve always wanted to enter? Do you feel that the job will be a good stepping stone that will give you the experience you need to apply for more advanced positions decide to go ahead and apply in hopes that the employer decides that you are a good fit for the organization. When you apply for a job, it’s also important to remember that you have no idea of the competition you are up against. Employers may find that your background and personal attributes will be a great fit for the company, even though you may not feel qualified for the job. I’ve seen job seekers that fall on both sides of the spectrum. There are those job seekers that will apply for anything in hopes of getting called for an interview. When job seekers apply for a job they may look briefly at the job description and the requirements of the job. Although this may work for some job seekers, focusing more on the jobs you are interested in or qualified for can definitely save you time and energy. On the other hand, I often work with job seekers who feel that they don’t meet all or any of the qualifications that are listed on the job posting. These job seekers believe that they must be highly skilled in order to apply and they must be able to meet all requirements of the job. The thing that’s important for job seekers to keep in mind is that universities are learning environment and that employers don’t expect their graduate employee to have all of the knowledge and experience they would need if they were applying for a higher positions. Oftentimes employers will start with a phone interview to see if they feel you are qualified for the job. Internships are a way to gain the knowledge and skills required when they are seeking a full-time job; therefore, as a fresh graduate I would encouraged you to at least apply for internship so you have a chance of gaining the experience you will need to get hired once you have passed out from NYSC. While we can debate the issue of you to apply for a job that you don’t feel qualified for, it’s important to realize that it’s not always the most qualified candidate that gets the job. As mentioned above, if you establish great rapport with the interviewer and exhibit the most enthusiasm and confidence, it is highly likely that you will get hired even over other candidates that meet 100% of the qualifications. Going into the interview with a positive attitude, motivation, and a strong work ethic you will increase your chances exponentially in getting hired for the job. Check Out: Top 10 Killer Tips To Impress Employer at Job Interview! When you don’t quite meet the job requirements – Three steps to landing the job anyway. Read the job description and envision what a typical day could entail: Do you have the skills to perform the necessary tasks? If you are perfectly qualified to handle the day-to-day requirements of the job, but don’t have those extra skills listed at the bottom of the job description,, you’re still likely to get the position. Instead of saying “I know I don’t have the right experience, but… – talk about what specific skills you gained from your previous job and how the apply to this role. 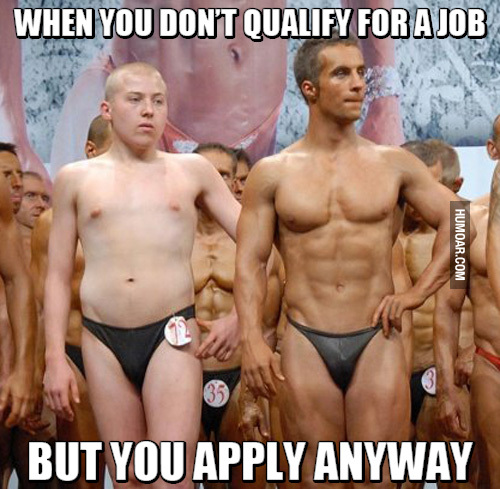 Have your ever applied for a job you weren’t qualified for, what was the outcome? share your experience in the comment below for other job seekers to learn. ← Asking for the Job during an Interview – Best strategy to getting a job.